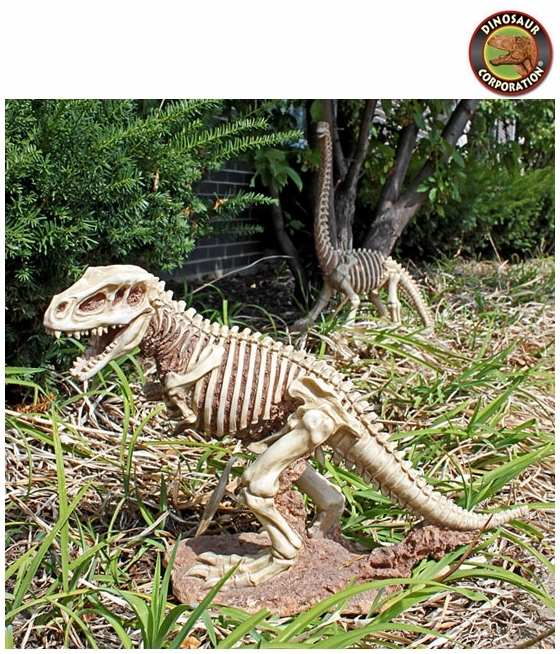 Home | MODELS, KITS | T-REX REPLICAS | T-Rex Dinosaur Skeleton Statue 21"
T-Rex Dinosaur Skeleton Statue 21"
Unearth your very own raptor with this Cretaceous age dinosaur sculpture sure to shock and awe garden visitors as they discover an paleontological gem hidden right in your flower bed. Be your very own back yard paleontologist with this sun-bleached discovery from the Mesozoic Era! Stretching nearly two feet long, this quality designer resin statue replicates the weathered bones of a extinct prehistoric monster that once roamed the earth. Visitors will admire your creative garden style as our T-Rex Skeleton sculpture makes a Mesozoic statement!